When your wedding guests leave their well wishes and marriage advice on each of these book-shaped, fairy tale cards for the bride and groom, they are encouraged to take a miniature rose dome home with them as a keepsake of the wedding day. A string can easily be attached to the rose domes to create a delicate ornament. 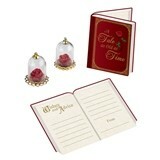 Eight (8) signing cards and eight (8) rose dome favors are included in this set and prices indicated below are per set.